The Melanie Kisten Dance Academy celebrates 21 amazing years in the entertainment industry with an exciting new theatre production – The Bread, The Porridge and The Mix Masala. This runs at Sibaya Casino’s iZulu Theatre on October 21 and 22, 2017. This theatrical fusion of comedy, dance and music is written, directed and produced by Melanie Kisten, who previously staged the hit production, Kambakht ISHQ. 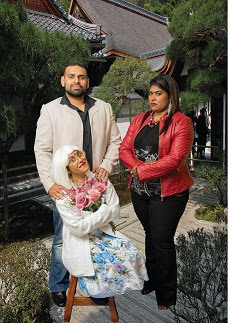 The production features Kisten, who is now known as the ‘crab aunty’ in the local movie, Keeping Up with The Kandasamys; and also stars her dynamic team of performers: Desiree Kisten, Marsha Kisten, Thiru Reddy, Keelan Govender, Kubeshan Naidoo, Leshna Nair, Aliosha Nair, Sagy Kisten and Bhavanie Kisten. ‘Audiences can expect a rollercoaster ride of emotions, be enthralled by the high energy, and the emotionally charged dance sequences by the students of my dance academy,’ says Kisten. The Bread, The Porridge and The Mix Masala runs at Sibaya Casino’s iZulu Theatre on October 21 at 18h00 and on October 22 at 15h00. Tickets R120 booked through Computicket. For phone bookings call 0861 915 8000 or book online at www.computicket.com.